Family owned and operated, Hornsey Moving and Storage has been serving the Riverbend since 1917. Established in Alton IL, today we are located in Wood River IL. 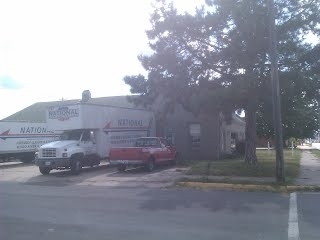 We are an agent for Chicago based National Van Lines, Inc. We service residential and light commercial customers. Area served include southwest Illinois and eastern Missouri, centered in the St. Louis Metropolitan Area. We can preform long distance moves or we can arrange them with National Van Lines. We specialize in handling pianos.We also offer packing and storage of items. If requested, estimates are available and are free of charge. You can contact us by telephone at (618)-254-4361 during the weekdays, 8 am to 5 pm. Our fax number is (618)-254-4392. You can contact us by email at fred@hornseymoving.com. Whether you are moving with us, another mover, or doing it yourself, these tips will make the process smoother and safer. The earlier you book your move, the better. Call us about six to eight weeks before your intended moving date to set up an estimate. If you decide to use us for your move, please schedule the move at least four weeks before your intended moving date. This is important, especially in the summer, when we are the busiest. Almost all items that can fit in a box should be in one. A lot of loose items take much longer to move than if they were in a stack of boxes that could be moved all at once with a dolly. Items in the box should be surrounded with a packing material, and breakables should be completely cushioned by packing material to prevent damage. Empty space should be filled with packing material or other warped up items. Make sure boxes are filled up to the lid. Boxes that are heavier are placed on the bottom of the tier of boxes in the truck, and have to take the weight of other boxes. If the box is half full, it will probably collapse. Detailed instructions and tips can be found Moving.com: Packing Like a Pro. Make sure areas for walking are cleared and appliances, computers, lawn equipment, and any such items that are going are prepared for the move. For more tips and answers to any and all questions, see NationalVanLines.com: Plan Your Move, Moving Resources, Moving.com: Articles or just ask us at any point before or during the move! hornseymoving.com is managed by admin@hornseymoving.com and hosted by Google, Inc.